PREEvision supports the development of E/E system architectures and their optimization for more efficient systems, lower cost etc. All important technical and economic aspects of an E/E architecture can be modeled with the help of graphical or chart-supported editors. Automatic routers and consistency checks accelerate development, and ensure consistent modeling. Multi-dimensional comparison of architectures according to customizable criteria, such as cost, weight, installation space, bus load etc. To develop a cost-optimized and robust E/E system, PREEvision enables the easy evaluation of architecture alternatives, even during early development phases. The factors for success of an architecture can be determined and weighed by the architects themselves. A multi-dimensional decision network can be laid-out for evaluation of the architectural design. In addition to important optimizations for the overall vehicle, such as weight, costs, installation space, cable length and power consumption, PREEvision also takes E/E system-relevant targets into account, such as the bus load and timing or security requirements. It is also possible to compare an architecture in different vehicle variants of a product line. Finally, the architect decides on the basis of a multi-dimensional decision network. To develop all aspects of an E/E architecture PREEvision offers a feature-rich domain-specific graphical language. This language was developed together with experts from the automotive industry and is continually expanded. The resulting data model is layered to cover special requirements from different development domains. The modeling layers range from the logical architecture over software architecture, topology and communication design up to the hardware geometry. For each modeling layer PREEvision provides dedicated editors like diagrams, tables or forms. The goal of PREEvision is to offer fast conception and evaluation of architecture alternatives over all relevant technical levels. Thus data available from other tools can be imported and then easily merged into the model. PREEvision supports important industry standards and the corresponding exchange formats for import and export like AUTOSAR, DBC, RIF, KBL, LDF (LIN) or Fibex (FlexRay). PREEvision import and export formats at a glance. In early phases of development, the results of the performance comparison provide architects with valuable data for making decisions on determining the architectural design. During the development process the performance comparisons provide important information for the refinement of the architecture. Thanks to the comprehensive data model, the finalized architecture model can be used as the basis for further development of the E/E system. Architectures are easy to compare with PREEvision. Criteria for success can be freely defined by the architect, and the status quo can be read out in reports at any time based on the current model data. Multiple factors for success can be taken into account: A multi-dimensional decision network can be laid-out for evaluation of the architecture design, and thus an architecture can be evaluated in comparison to other alternatives. The data model holds information required for quantitative evaluation. On this basis, for example, weight or bus load may be calculated. Consistency checks assure that architecture variants are not only promising but valid. PREEvision allows for checking consistency on rule-based and fully customizable consistency models. As no architecture under development is completely consistent from scratch, consistency checks can be run with respect to the actual development state. Consistency checks can be run manually for selected rules and can also be applied in permanent background checks. The parameters for benchmarking of alternative architecture designs are calculated with metrics. PREEvision provides a powerful framework for metric development and calculation based on Java and features a host of included metrics which can be enhanced by the customer. Metric blocks are a component of the graphical metric language and can be modeled in metric diagrams. Metrics used within the metric framework are always run against the current model data. They can be calculated using the overall model or a previously selected variant. A model-based E/E architectural design must enable the many new functions of the next vehicle generations. Here, the driver assistance and connectivity domains, in particular, are leading to major technical changes. E/E architects face the task of having to connect these innovations to the classic powertrain, chassis, body and multimedia domains. PREEvision provides this support with versatile functions and also takes into account the latest technologies and development standards of the automotive industry. To control the growing functional scope of future E/E systems, an integrated view of the overall architecture within and outside of the vehicle is required. Service-oriented E/E architectures, in particular, are increasingly being used in the driver assistance domain and connectivity environment. First and foremost, they identify the challenges of future architectures! The consistent use of model-based tools such as PREEvision lends itself to the approach and mastery of these challenges. The many advantages of such comprehensive solutions for the overall E/E development process help architects to implement the innovations of the next generation of vehicles and reliably help them reach their goal. 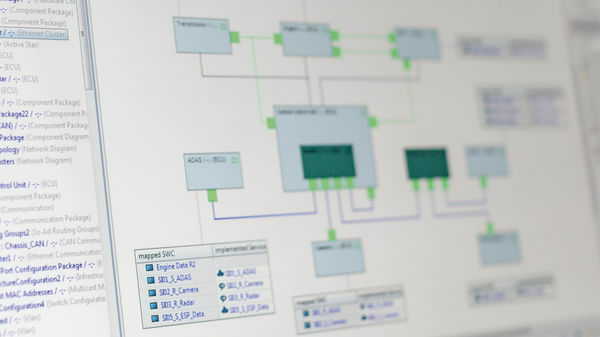 PREEvision offers a comprehensive modeling language to describe all aspects of e/e systems. All engineers involved in the development process find tailored diagrams and editors for their work. And all in one integrated tool. With PREEvision, E/E architects design and optimize the onboard network architecture, for example. Integrated requirements engineering and management for vehicle electronics and automotive E/E systems. Compare alternatives, optimize the design and ultimately develop the wiring harness in detail.